Life is like a vast ocean, full of deep mysteries. Life is like a roller coaster, with many ups and downs. Life is like a path through the forest, and you never know where it will take you. Of all the many metaphors for life, one of the most enduring, it seems to me, is the metaphor of life as a quilt. Put together bit by bit, using rather ordinary materials, yet the whole is definitely greater than the sum of its parts. And in the end, it tells a beautiful story. Although I’m not a quilter, I do confess a love of textiles and stories. So put the two together and you’re bound to catch my attention. Which is exactly what happened several years ago, when I saw a blurb in the paper about Joe Cunningham, in town for one night to perform his solo theatrical piece, Joe the Quilter. Not only would Joe be telling stories, singing songs, and playing his guitar, but he’d also be showing the quilts he made. Now this kind of unique and quirky performance art is right up my alley, so off I went. And Joe’s show was a delight. But as the years passed, it became just a pleasant memory, recollected now and then. Until last month, that is, when Dave and I gathered ourselves up for a trip to the de Young Museum to see the King Tut exhibit. Much to our surprise we discovered that Joe the Quilter was the current artist in residence, and would be there on the day of our visit. What a lovely bit of serendipity! So there I was, unexpectedly chatting with Joe. And suddenly ideas began tumbling out of my brain. I knew with absolute certainty that I should write about Joe. An instant later, I knew I should also have a deeper conversation with him. And finally, I knew I should record it all for you to listen to. And that’s just what I did. Joe and I connected by phone and spent 50 minutes musing about life and art and quilts and creativity and stories and meaning and choosing an unconventional path. It will probably come as no surprise that I had a blast. There’s nothing I like better than a heartfelt exchange with a kindred soul. And Joe was the most amiable partner, riding along on my Meaning Mondays quest to experiment and try new things. Below, you’ll find snippets of our conversation, which I hope will entice you to listen to the whole thing. I’ve noticed people tend to tell the same story, in many different guises. I’m fascinated by this. It’s almost like we have a personal story, a narrative. It opened up a door for me to gleefully say things I wouldn’t be able to say otherwise…But I wasn’t consciously aware when I was creating this, that oh, I get to make this be a metaphor for me. Any number of strands all came together without me consciously thinking. I was just making it all up, you know? I was trying to convey this idea that I try to live by and create art by, that you don’t have to know what you’re doing. You don’t have to wait in order to start doing something. You can find out what you’re doing by doing it. People are soothed by different things. Some are soothed by knowing what’s going to happen. Others are soothed by not knowing what’s going to happen. I’m an extreme case of that…I wouldn’t be able to live like this, though, if I didn’t trust that it was going to turn out alright. But I think that everybody has the potential to tap into trust. It involves letting go of your desire to know how it’s going to turn out and to be willing to improvise. Then I came up with a big idea: What if I made a quilt that was not trying to please, not trying to impress, not trying to do anything? What if I just did something that amused me? That would be so simple that anybody could do it? But I’m the only person who would do it. I knew exactly what I was doing this time. I knew this quilt signified a break from the past, where I had been going along for 25 years, proving all the time what a great quilt maker I was. And that this was a step off of that path and into unknown territory, which I recognized at the time was home for me. Oh, now, if I can do this, I thought, I can go home. I’m not sure, but I think I can call this my first podcast. What fun! IF YOUR LIFE WAS A QUILT, WOULD IT BE HAND STITCHED OR MACHINE STITCHED? Quilt photos courtesy of Joe Cunningham. Oh, mine would definitely be hand stitched. Did you know, there is a wonderful quilt museum in Cooperstown New York? I don’t quilt, but I love to see what others have done. They have them up on the walls, protected by glass. This reminds me of my writing. Sometimes I have the entire story in my head, but other times I let the characters take me where THEY want to go. I will send you an onvite to my (private) story blog as soon as I leave here. Thanks, Shay, for the onvite! I’d love to visit that quilt museum. Isn’t there also a baseball museum there? Interesting juxtaposition. Anyway, the de Young had an amazing Amish quilt exhibit there when we saw King Tut and met up with Joe. It’s an incredible art form. Yes, Cooperstown is the home of the Baseball Hall Of Fame. I enjoyed that, but when the guys went back for a second tour, I went to see the quilts and the farm museum, which is a recreation of a 19th century farm. It really moved me, I had the strangest feeling of deja vu, especially in the old timey chuch building there. I felt so strongly that I had been there before. Hi Shay – Sounds like a truly memorable and mystical experience to visit that quilt museum. I’m thinking that my life’d be more of a scrapbook, full of obscure cuttings and bookmarked non events prefaced with scribbles to manufacture meaning. There’d be rare sightings of purpose and confidence dressed up a little too formally in straightlined building plans (that were scrapped, thank goodness) and more common sightings of awkward beauty still finding its feet in crayon dreams. Oh, I love that Tony. Life as a scrapbook. You describe it so eloquently. And I too fell in love with “The Way Home.” There’s a real story behind that quilt, so if you do ever get a chance to listen, I think you will be very touched by it. Thanks! Hi Patty, thanks for such a delightful piece! I love how he talks about breaking from the past and everything he says about trusting in the unknown territory. I had the pleasure of chatting with Joe the Quilter last week when he came to my office to help me install a quilt. I was delighted to learn that he liked what I picked out for my blank wall and that he even had a little history with said quilt. We chatted about our sons, about having music be such a big part of our lives (he knows Joan Jeanrenaud who my husband is currently collaborating with), a bit about his childhood on a farm, and about the joys of living in SF. He is a true creative force and a naturally positive soul. As for my life as a quilt, I’d love to be able to say I’m completely hand-stitched but I know that at this point, parts of my stitching are machine-fabricated (a product of institutions in which I’ve participated). I’m working on undoing the machine-made stitching (or at list hand-stiching over those cookie-cutter lines) to integrate a little more volume, texture, color and depth. Hi Belinda – I love what you say about hand-stitching over the cookie cutter lines. I think we can all relate to that. And I’m still just delighted by the serendipity we discovered last month between you, me, and Joe the Quilter. Those are such wonderful moments of life. Thanks! A joyful post. I am a quilter and would like to be a story teller. Loved this. Thanks Patty. Thank you, Erin. I’m thinking you are a storyteller! And I’d love to see your quilts. Hey, maybe someday you will even be able to see Joe’s show. Did you know you can get it on DVD? It’s on his website. 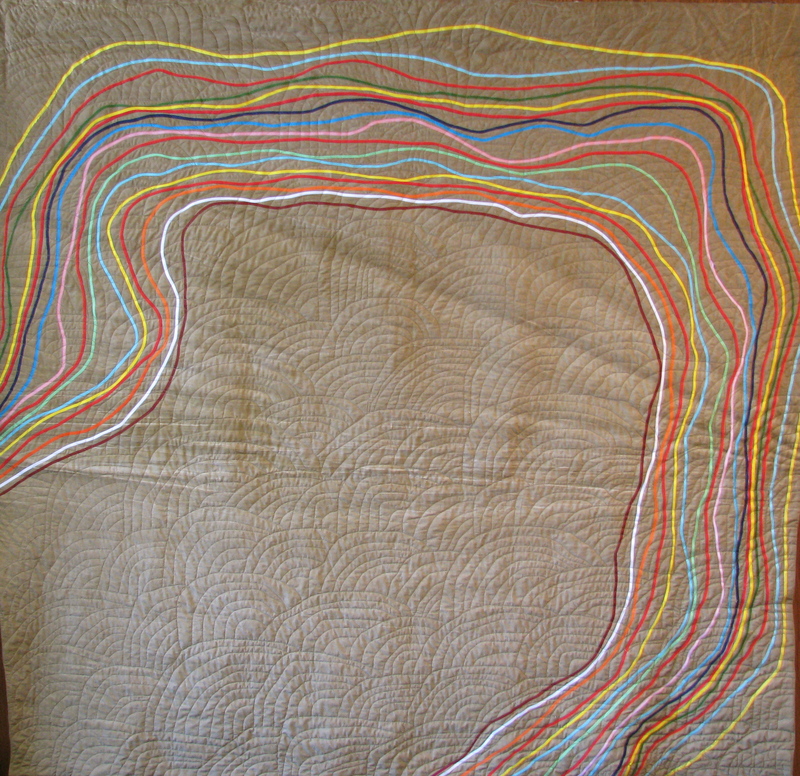 Patty – my quilt is handstitched with new patches added every day. I love the images you shared – beautiful. 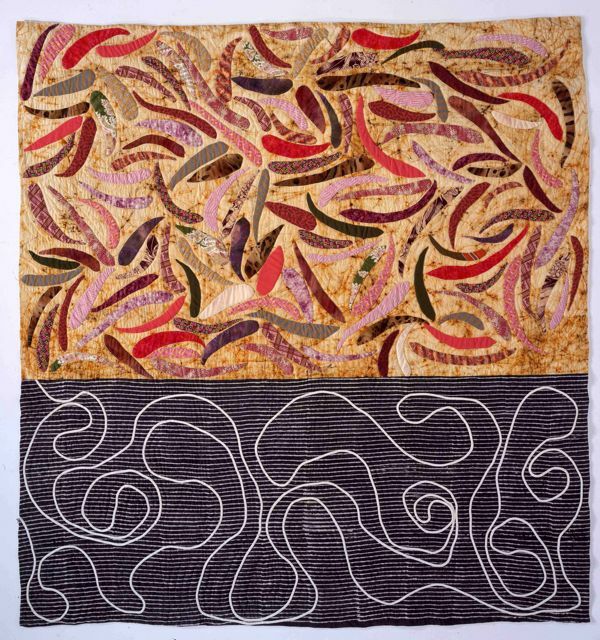 Quilting shows how the endless variety of life can be brought together in one beautiful whole. Inspiring – thank you! How wonderful, Phil, to think of it as new patches each day. Thank you! I have never thought of life as a quilt – which is kind of surprising as I have my daughter make two quilt squares each year on her birthday to make into a quilt when she is older – each square capturing a little piece of her character or creativity at that point in time. And, I organized a “quilt of hugs” for her involving family and friends when her life started turning sideways so that she would be able to wrap herself in the love of those who know her. Not to mention my moms quilt and we have quilts that date back generations. 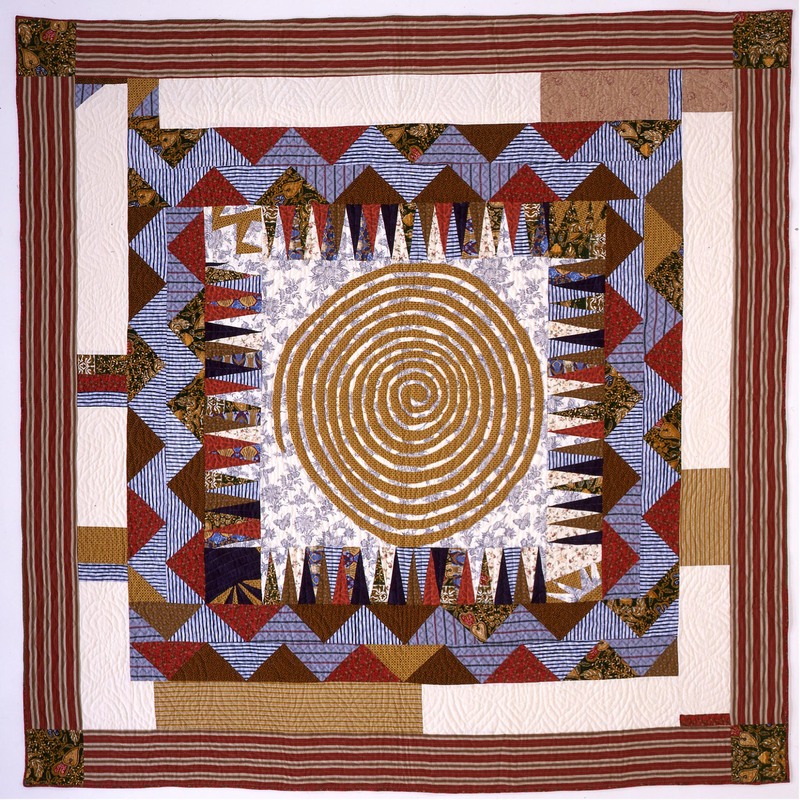 I am drawn to quilts that have stories and relate the history of the family or the period. Yet, I see life as a tapestry. Each thread builds something larger. Sometimes we don’t know the picture or the pattern until the tapestry is completed… and it isn’t just our own threads, as each life has threads of other lives that help build the final product. To take out one thread or to disentangle it form the tapestry is not possible though we might wish it so at times. I checked Joe’s site – the quilts are wonderful and creative. Wow, that is a beautiful ritual with your daughter. I can just imagine the story the quilt will tell when each piece is sewn together. I love your idea of the threads of a tapestry too, how they are all interwoven. Very profound. Thanks! Great interview, thanks for sharing Joe with us. The big thing that jumped out at me from your conversation with Joe was that when he let go of outcome then he took off. I see this true in so many people, when we let go of the outcome, when we don’t worry from an ego perspective about what people will think or if what we do will be accepted, etc then the magic really starts to take place. Yeah, wasn’t that cool when he talked about that? I know that’s a universal theme, but it always resonates for me to hear it again. Thanks for your comment! I’m pretty sure my quilt would be like a mosaic, made up of torn yet beautiful swatches of material, each representing parts of my life and the lessons I’ve learned. Thank you, Sara! I love the idea of torn bits of beautiful material, rough edges among all that beauty. Such a truth about life. Congrats on your first podcast, Patty!! I, too, love the metaphor of life as a quilt. Actually, it isn’t one I’ve thought about before – but it is just the perfect description. I’m going to keep that image in my mind. This quote from Joe is great: “You can find out what you’re doing by doing it.” Yes, I must remind myself of this. Just start. Just do. Learn by doing. Don’t wait until you have it all figured out. Jump in. Yes, I love that quote too, Eva. Sometimes I think I have to wait until I know more, but all my best experiences have happened when I just jumped in. Thanks for the comment! Hi Patty ~ great first podcast! I am drawn to your guest (and you) due to your interest in people’s stories. Joe the quilter is quite a find! And, he makes the most beautiful quilts — amazing. I’m particularly drawn to Joe’s comments about each person having a story he or she tells over and over, which you agreed with (and so do I). I enjoyed the example of the person who is always fighting the war, battles the enemy, and sometimes they just don’t, “get it.” And this repeats over and over in various narratives. As for your question, I’d have to say mine would be hand stitched. My life has never gone in a direct line (machine sewing), and has been full of random events which has taken me to places I’d never thought possible. I really loved that you asked this question alongside your post — it made me get out of my “head” and think in a new way. Hope you’re well, Patty, have a great week! Hi Lori – Welcome, great to see you over here! Come and share a story any time. And yes, Joe is really tuned in to the nature of story, the ongoing narratives of life. I’m fascinated by those deep archetypal stories, and I feel very lucky that I get to work with people around that. I’ve learned that people often don’t “get it” because the story is so very powerful that it puts us in a trance, like a possession. I like what you say about your own story: no straight lines. Joe has a quilt that is stitched in a very crazy, random manner, and I think that’s a wonderful metaphor for what you’re saying. So thanks for sharing that! Hi Patty! I saw Joe on Simply Quilts – a show that used to be on HGTV for years. Joe gave a hand quilting demo that really taught me how to! I love this man! Sooo glad you interviewed him. I have made 4 quilts by hand – pieced by hand, quilted by hand. I loved the process. The first one I pieced I did when Garrett (my son) was in Iraq. I call it the Iraq quilt. My last quilt – #5 – was hand pieced but machine quilted, first time! But I’m such a purist that the whole thing for me is the steady hand sewing – it is so peaceful. I LOVE LOVE LOVE the metaphor of quilts as our lives – indeed – all the pieces make the whole! So did Joe inspire you to take up quilting? He is a wonderful person! I’m glad for you to have had this time with him. Oh, I love it that you already know and love Joe and have learned from him. Warms my heart to hear it! I’d love to see your quilts sometime, too, suZen. But no, I’m not so much inspired by Joe to start quilting, but rather to keep finding those intersections between creativity and story and meaning and going off the beaten path and a life well-lived. And I’m also inspired by his generosity and spirit. Hugs to you! Patty, this was such a lovely sharing – thank you so much. And I loved the image of life as a quilt. This also means that we can choose the pieces that go into our story – and we can also choose not to include those snippets and colors that no longer fit the pattern at different points of our lives. We have so much choice as to how our quilts turn out, so much creative power. We can even undo the stitching and start over – replacing and recreating – what a fascinating and endlessly empowering process. From a mountain garden in Japan – I just came in from working in the spring soil – greetings to you – Catrien Ross. Exactly, Catrien. There’s a lot of both adding and deleting in quilt making. And it’s so funny you mention undoing the stitching, because that is exactly what Joe was doing on the day that I met him! Thanks for stopping by from Japan! I love the pictures and the post! Recently, I decided to pay heed to my inner yearnings, instead of listening to a load of advice on what I should be doing. I stuck to my cave. I had been having a great time with my art projects and publishing them on my site! That’s wonderful, Evelyn. It’s so freeing to follow that melodic inner voice. Because, truly, haven’t you had enough of all those scratchy voices of “should?” I know I sure have! Thanks so much for the visit! My quilt would be bright and imperfect, but ambitious. How refreshing to see imperfect and ambitious used in the same sentence. Love it, Scarlett. Thanks! I’ve had my blog up and running only since April 2. I nearly named it Patches because of the life = quilt metaphor. Read about my blog here: http://silkpurses.wordpress.com/about/. It tells why, instead, I named it Silk Purses and Sows’ Ears. I’ve been following your blog for only a few days, Patty. I love your insights. Hi Pat – Welcome! So glad you’ve stopped by, and I so appreciate your kind words. I’m looking forward to returning the visit to you. « What Did You Love As a Child?